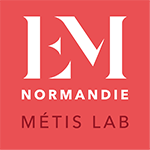 Governed by three strong principles (Practical Intelligence, Cross-disciplinary Knowledge and Openness towards Professionals), the research policy implemented at EM Normandie applies under a serious and progressive approach. The outreach and academic attractiveness of research are deployed through scientific events organised or co-organised by lecturers/researchers. The Dean of Research sets individual intellectual contribution objectives for lecturers/researchers and supports them to achieve their objectives.